Rav Avrohom Yeshaya Kanievsky, the Steipler’s grandson (son of Rav Chaim Kanievsky), once asked the Steipler, “From what age should one begin to be mechanech one’s child?” The Steipler replied that one must engage in chinuch even with an infant. When one sees an infant engaging in negative behavior he should already potch him. In no way, however, can the potch be done out of anger. If chas v’shalom anger is shown the only thing that one will be teaching the child is that becoming angry is something to emulate. Even at a very young age one must imbue the child with the knowledge that there is Olam Hazeh and Olam Haba, that there is Divine reward and punishment and that there is Gan Eden and Gehinnom. One must constantly talk about these concepts until they deeply penetrate the heart and mind of the child. Why? Because when the child grows older and his yeitzer hara begins to burn within him, enticing him to sin, he needs a tremendous amount of energy and self-control to overcome the tremendous pull of the yeitzer hara. If he the ideals of schar and onesh are deeply rooted in his very psyche it will invaluably assist him in his quest to overcome the yeitzer hara. The Steipler would recall how, when he was a child, his mother would send him to listen to the drashos of the itinerant maggidim who would come to town. Their words would fill him with much chizuk. In keeping with this desire to imbue yirah into children at a young age, the Steipler would learn with his grandchildren the seforim of Rabbeinu Yonah, Mesilas Yeshorim and the Sefer Hayirah written by Rabbeinu Yonah. With girls as well, the Steipler would advise that they be taught the Sefer Orchos Tzaddikim. When a girls’ dorm counselor came to ask for advice he directed her to learn Orchos Tzaddikim for a few minutes a day with the girls in the dormitory. 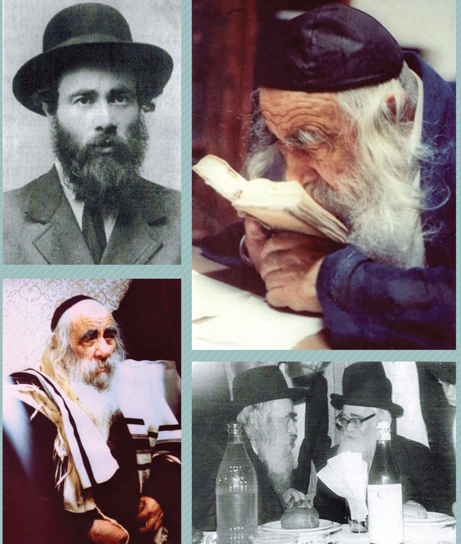 Rav Shmaryohu Karelitz related that when the Steipler’s son, Rav Chaim Kanievsky, was a two-year old infant the Mashgiach of the Novardoker Yeshiva in Pinsk where the Steipler learned and taught came to his house and was playing with young Chaim. When the Mashgiach asked the two-year old to help him find a “Medrash”, he was flabbergasted when little Chaim walked up to the bookshelf and pulled out a Medrash Rabbah. How had he known what a Medrash was?! It turned out that the Steipler would play with his son by pointing out the different seforim in the shelves and saying, “This is a Shas, this is a Rambam, this is a Tur, this is a Shulchan Aruch and this is a Medrash…” Young Chaim absorbed all of this just by looking at the seforim, even though he did not yet know how to read. The Steipler would even advice parents to use candy to bribe a two-year old to sit still so that his parents could learn mussar with him and teach him about reward and punishment even at that tender age. What Does One do with a Child who doesn’t Daven or Skips Large Parts of Davening? A father came to the Steipler and asked him what he should do with his son who finishes davening or bentching at lightening speeds making it clear that he is just skipping large chunks of the davening or bentching. The Steipler replied that not only will pointing out his folly not help matters it will often cause the child to rebel further because he will feel pressured. Telling him off is not recommended nor will it help. What then should a parent do? The Steipler replied that one should speak to the child in general terms about the importance of davening, what it means to have the opportunity to talk to Hashem and how each word that one says has such importance in the upper worlds. Having such a talk with the child precludes the necessity to force him to daven over or go back to the beginning of davening and is truly a fulfillment of the mitzvah of chinuch for davening. To Potch or Not to Potch? The Steipler would also potch a child who lied. Should One Choose a Cheder for His Child where the Cheder Davens the Same Nussach as One’s Parents? When asked whether one should choose a cheder for a child based on what nussach is davened is the cheder, the Steipler answered, “That is not something that should be part of the equation. The main thing in choosing a cheder is considering whether a cheder is one in which the child will absorb the most Torah and the most yiras shomayim. The only time where something like nussach haTefillah would come into the equation would be if there are two chadorim that have the identical standards regarding Torah and yiras shomayim and one davens in the nussach of one’s ancestors and the other does not. In that case one should choose the cheder that davens in one’s family nussach. If a Person has a Particularly Bright Child, Should He Advocate Skipping a Grade? In times gone by, the Steipler explained, parents were able to implicitly rely on the melamed to teach their sons. When the atmosphere was a pure one and the melamed was possessed of yiras shomayim, the child did not need more. In our times, however, a father himself must also educate his children and the father (when possible) should supplement what the child learns in cheder by learning with his child as well. When it came to profusely praising one’s students, the Steipler recommended caution. “Rebbeim of young bochurim have to be very vigilant in how they give praise,” he would say. “When a bright young bochur asks an excellent question or puts forth a worthy chiddush, the rebbi in his love for his talmid and his desire to encourage him will frequently heap exaggerated praise upon him. The rebbi might tell him that he is destined to be a gadol hador or one of the gaonim of the generation. Although they mean well this exaggerated praise can work against the bochur as he gets older. What happens when he bochur leaves his yeshiva where he is one of the best bochurim and goes to bais medrash (yeshiva gedolah) – which is a much larger yeshiva with a much larger pool of gifted talmidim? All of a sudden the “ilui” of the yeshiva has competition. There are numerous bochurim who are even better than him. A bochur who has been led to believe that he is literally at the top of the heap and is en-route to becoming the next great rosh yeshiva and is suddenly confronted by the reality that there are many bochurim as good as or even better than he, can be thrown into personal crisis and possibly depression. Thus, even when engaging the noble endeavor of positive reinforcement, Rebbeim must be vigilant. Another area where the Steipler highlighted caution was in his advice to maggidei shiur that they should not burden their talmidim with too many chiddushim. Most talmidim become confused and as a result may lose their enjoyment of learning. Certainly, a maggid shiur should not totally refrain from giving over chiddushim to his talmidim but one chiddush [on each sugya] is enough. Even that chiddush does not necessarily have to be an original chiddush created by the maggid shiur but rather he can share chiddushim from others. The main focus of a maggid shiur’s shiur should be explaining the Gemara, Rashi and Tosafos. At times he can add a difficulty in the Rambam based on the Gemara and the Kesef Mishna’s resolution of that difficulty. The bottom line is that assisting talmidim with their varied problems is an important part of the building up of a talmid because this strengthens the bond between rebbi and talmid thereby empowering the rebbi to have a greater hashpaah in Torah and yiras shomayim on the talmid. The Steipler would often say that one does not achieve greatness in Torah as a result of brachos. “The only way to become a gadol b’Torah is by distancing oneself from batollah and utilizing time properly. 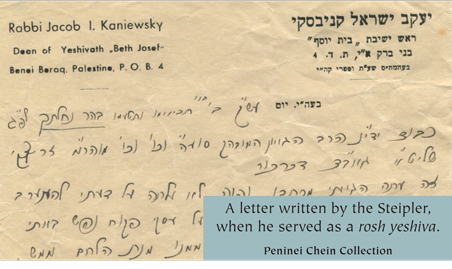 “It is for this reason,” he continued, “that it does not matter where one goes to yeshiva. The yeshiva-as long as it is run al taharas hakodesh, is not what determines if a person will become great in Torah, rather his diligence and perseverance are the prime factors. If he will learn with hasmodah he will succeed and will grow in any makom Torah. If he will waste his time, however, the good name of the excellent yeshiva that he so desired to attend, will not help him. “There are 24 hours in the day. Deduct eight hours for sleeping. [It is important for every bochur to know that one cannot neglect or make light of having the proper amount of sleep. If a person sleeps eight hours a day, his brain is calm and not under strain and he can learn properly. If he listens to his yeitzer hara and sleeps less his spiritual growth will eventually be inhibited by the lack of sleep.] Deduct another two hours for the three tefillos that one must daven and another two hours for meals and other material and bodily needs. Even after deducting all those hours, one is still left with a clean twelve hours a day to learn. A bochur has no other worries. He does not have parnossah worries, he does not have to marry off his children, he does not have to worry about paying off his debts… he has twelve hours a day to learn, free and clear! Often, the Steipler would be asked how bochurim or yungeleit could overcome being easily distracted and develop better concentration and focus in learning. He explained that learning how to concentrate is really dependent on slowly developing concentration by starting in small increments and adding as one goes along. For example, learn a line or a Mishnah, focus only on that line or Mishnah, learning it and reviewing it a few times until one really knows it. Only once that Mishnah is properly understood should one move on to the next line or Mishnah. The problem with so many young people today is that they want to know everything in one shot. Then, if they don’t succeed they say, ‘I have a problem focusing and concentrating.’ They become broken and lose their desire to learn. There are people who become depressed because they didn’t immediately understand the shiur or they don’t understand the Maharsha or the Rabi Akiva Eiger upon which the entire sugya being learned is dependent. The shiur should not be viewed at as an entity in itself but rather as a mere vehicle that directs a person to properly understanding the main components of the sugya. “The gedolim of previous generations,” the Steipler was wont to comment, “did not hold that the right approach to learning is to constantly try to be mechadesh. Chiddushim must come on their own. As long as a person does not have wide-ranging knowledge from all of Shas he will not be able to create chiddushim. The way to learn is that a person has to use his intellect to try to get to the bottom of the sugya, to try to understand what the Gemara is saying. Rav Chaim Brisker would often say that it is our task to understand what the Gemara says, not to create chiddushim. “There are bochurim who sit for an entire four-hour seder trying to answer a difficult question posed by the “Lechem Mishnah”. Yes, he asks a very good question. Nevertheless that doesn’t warrant spending four hours kvetching and trying to figure out an answer. There are those who sit for hours working on that question as if the responsibility to answer the question rests only with them. A person who truly wants to know Torah must learn a lot. If a person wants to familiarize oneself in many areas of Torah then he can learn the works of the Acharonim. The Torah however does not demand that you become an Acharon and make your own chiddushim. “If there is a strong question one should think about it. If he can’t think of an answer he can look in the Acharonim to see if they present an answer and that is it. He must be able to move on. “When I was a rosh yeshiva I had to say chiddushim in my shiurim. What did I do? It didn’t bother me at all if I repeated a chiddush of the Shaar Hamelech or the Ohr Someach.